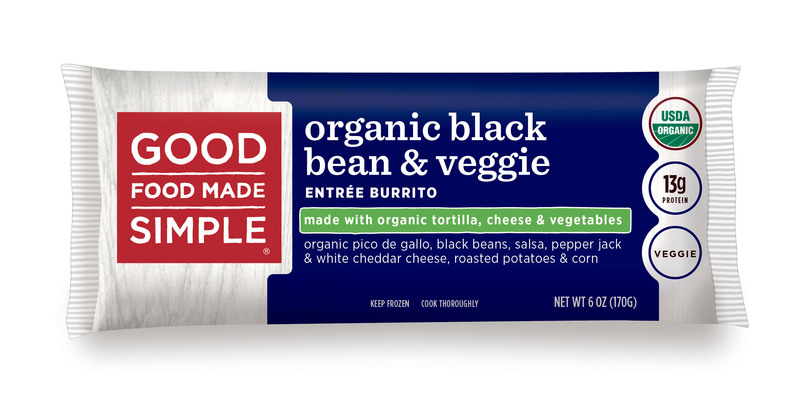 Your classic black bean and cheese burrito done better, packed full of organic veggies! Rich organic cheddar and pepper jack cheeses meld seamlessly with our organic black beans, organic salsa, organic roasted potatoes & organic corn. It's comfort food version 2.0 and all the better for the veggies! ORGANIC WHEAT FLOUR TORTILLA (ORGANIC WHEAT FLOUR, WATER, ORGANIC WHOLE WHEAT FLOUR, ORGANIC PALM OIL, ORGANIC CANE SUGAR, BAKING POWDER, SEA SALT, ORGANIC GUAR GUM, ORGANIC WHEAT GLUTEN, ORGANIC WHEAT STARCH), ORGANIC SALSA (ORGANIC DICED TOMATOES, DICED ORGANIC ONIONS, ORGANIC VINEGAR, ORGANIC LIME JUICE, DICED ORGANIC JALAPEÑOS, ORGANIC SCALLIONS, SEA SALT, ORGANIC GARLIC POWDER, ORGANIC CILANTRO, ORGANIC CUMIN, ORGANIC BLACK PEPPER, ORGANIC CORIANDER, ORGANIC CHILI PEPPER, ORGANIC CORN STARCH), ORGANIC BLACK BEANS, ORGANIC SUPER SWEET CORN, ORGANIC RUSSET POTATOES (ORGANIC POTATOES WITH ORGANIC OLIVE OIL), ORGANIC WHITE CHEDDAR CHEESE (PASTEURIZED ORGANIC MILK, CHEESE CULTURES, SALT, ENZYMES, POWDERED CELLULOSE TO PREVENT CAKING), ORGANIC PEPPER JACK CHEESE (ORGANIC MONTEREY JACK CHEESE [PASTEURIZED ORGANIC MILK, CHEESE CULTURES, SALT, ENZYMES] WITH ORGANIC JALAPENO PEPPERS), ORGANIC SWEET POTATOES, ORGANIC RED KIDNEY BEANS, ORGANIC RED PEPPERS, ORGANIC GREEN PEPPERS, ORGANIC SCALLIONS, ORGANIC CORN STARCH, ORGANIC CHILI POWDER (ORGANIC RED PEPPERS), ORGANIC JALAPEÑO PEPPERS, ORGANIC CILANTRO, ORGANIC GARLIC POWDER (ORGANIC GARLIC), ORGANIC LIME JUICE (ORGANIC LIME JUICE CONCENTRATE AND WATER). What makes simple food, well, simple? Happy hens produce wholesome eggs. Our chickens roam free, aren’t confined to cages or crates, and are raised without the use of antibiotics. Using unbleached wheat and whole wheat flour and no hydrogenated oils, we press our tortillas to steamy perfection. We never use artificial preservatives, flavors or colors and our meats are nitrate-free and antibiotic-free. Why? Simple tastes good. By using only fresh-from-the-farm ingredients, our chef-inspired burritos let nature's flavors shine.